Working out at a gym is great and will by all means get you the results if you know what your doing. But how about this LA Bootcamp? First what is a Bootcamp? 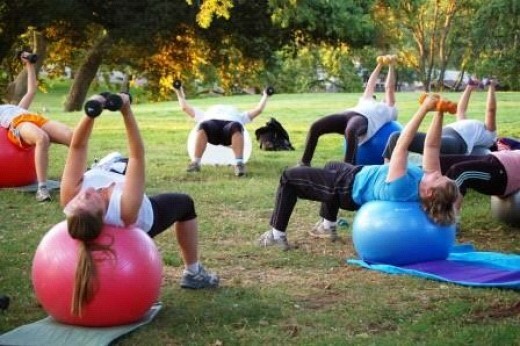 A bootcamp is usually held outdoors at a park or on the beach and is for a group of people all shapes and sizes. It should be for all fitness levels and it’s for anyone and everyone whether you workout at a gym or never at all. Usually ran by one or two instructers, they should have you moving for an hour strait with a few short breaks. The best Bootcamps are not the ones where you are being yelled at but rather motivated to keep going. Some people need to be yelled at, but most people enjoy and use encouragement. The amount of calories you can burn at a Bootcamp is up to you.. how does between 500 and 1000 sound?? You will be doing excersizes geared towards blasting fat and building strength and flexibilty. You can go with a group of freinds, co workers, or a group of strangers/future freinds. The hour will fly by and at the end you will be tired but feeling great about yourself. Bootcamps are usually offered in either a package of sessions or you can go once a week. The benefits are through the roof results and weight loss. Like I said, no matter what your fitness level is, a Bootcamp will be challenging and get you the results you need. We hold our LA Bootcamp at the Sherman Oaks Memorial Park and I guarantee not only a fun enjoyable experience, but a better quality of life becuase of the results you will get. Contact me and lets get started!! The Price is right and since I Adam Kipling the Los Angeles Personal Trainer, am so passionate about health and fitness, I will make myself available to you 24/7 for tips, guidance and extra help to make sure you get he results you want! Contact me to learn more about The LA Bootcamp and how we can set up a class near you or near your work!! out there is actually reading me. Please make sure you are self hosting your WordPress Blog.